Hon. George A. Hopkins of Kokomo, Indiana passed away at age 76 on October 31, 2018. George was born December 3, 1941 to Dorothy (Cleveland) Hopkins and George M. Hopkins. He graduated from Kokomo High School in 1959 and proudly attended Indiana University, where he graduated in 1963. He was a graduate of Indiana School of Law in 1966. 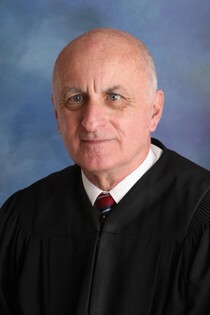 George retired with nearly 35 years of service in 2001 as a Colonel in the Indiana National Guard, serving in the office of the Judge Advocate General. He served as a practicing attorney for 39 years in Howard County before becoming Judge of Superior Court IV in 2006. Judge Hopkins will be laid to rest in his family’s plot in Weston Cemetery in Rensselaer, Indiana. He will be escorted past the Howard County Courthouse at 9 a.m. Tuesday morning on the way to the cemetery. Shirley & Stout Funeral Home & Crematory has been entrusted with funeral arrangements.